why cant you use this electricity that is right over us ? I'm unclear as to the purpose of your question, TROLL? Are you trying to suggest there aren't currents carrying up to a TW in the upper atmosphere? 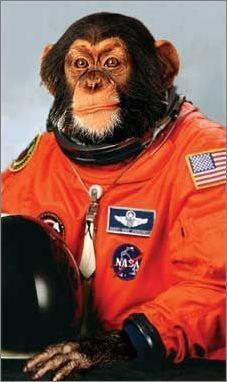 You don't believe an article from the European Space Agency? And this has what to do with proving the existence of dark matter? You *know* it's all around you ... right? ... but you and the mainstream's best scientists can't even figure out a way to identify what it is ... just saying. The above post only proves how little you know and with, obviously, no desire to learn more. ... and even what I've posted in this thread about the topic (which you obviously have not read). As for you leaving the "electric universe", let me assure you that your exit will not be a loss. Because for all your bluster, you still offered no explanation for all those helically would plasma filaments that mainstream telescopes show out there. And you still can't point to ANY proof of the existence of the gnomes mainstream cosmology is built on. Actually, this is a gnome built on a gnome built on a gnome built on a gnome! That’s sort of logic is called desperation. You see, there’s something funny about pulsars. They might not be what the mainstream assumes. Now all of this I’ve discussed before … to the sound of crickets from mainstream believers like rrober49. But let’s talk about the puzzling observations related to pulsars again ... just for old times sake. Of course to make their explanation work, they had to posit a new kind of dark matter … asymmetric dark matter. So one gnome suddenly became THREE. And of course none of the gnomes has ever been actually observed to confirm it's what they claim. The sad thing is there's an alternative. Back in 1995, two physicists (Healy and Peratt) came up with an explanation for pulsars that didn’t involve any magical objects. Here: http://adsabs.harvard.edu/full/1995Ap%26SS.227..229H . They concluded, “Our results support the ‘planetary magnetosphere’ view, where the extent of the magnetosphere, not emission points on a rotating surface, determines the pulsar emission. In other words, we do not require a hypothetical super-condensed object to form a pulsar. A normal stellar remnant undergoing periodic discharges will suffice. Plasma cosmology has the virtue of not requiring neutron stars or black holes to explain compact sources of radiation." Now you'd think that a discovery like that would merit some attention. But no, the Big Bang community simply IGNORED the paper. COMPLETELY. And what about those pulsar jets? They've actually built such devices in the lab. 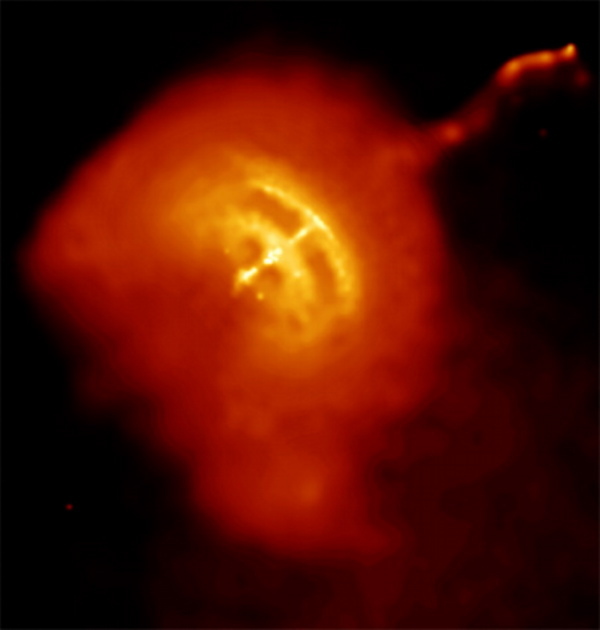 Now not only do the "bow-like" arcs observed in the Vela Pulsar have the same shape as the discharge from this device but the plasma filaments that form in a focus fusion device look a lot like the circuit diagram envisioned by Hannes Alfven to explain what is going on in and around stars and galaxies. 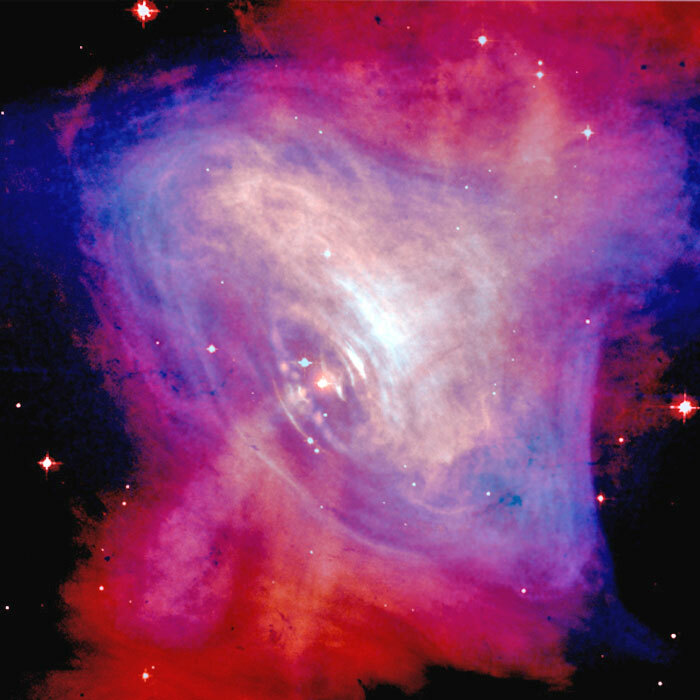 Plasma cosmologists note ( http://www.thunderbolts.info/tpod/2004/arch/040920pulsar.htm ) that "astronomers expected that the 'rotation' (pulsing) of the neutron star--conceived as an isolated mass in space -- would slow at a consistent rate. But then they observed a significant 'glitch' in the pulse rate, an event that 'released a burst of energy that was carried outward at near the speed of light by the pulsar wind.' Of course, unpredictable variations in both the pulse rate and intensity of an electrically discharging Pulsar would be expected with any changes in the electrical environment through which it moved. Proponents of the electric model are particularly impressed by the two embedded 'bows' seen along the polar jet ... snip ... . Astronomers initially called these 'windbow shocks', a theorized mechanical effect of high-velocity material encountering the interstellar medium. But electrical theorists recognized a configuration common to intense plasma discharge in laboratory experiments: toruses or rings stacked along the polar axis of the discharge. And subsequent enhanced pictures ... snip ... made clear that the 'bows' were in fact stacked toruses, not easily explained in gravitational terms." The shape is consistent with a homopolar motor ... the electrical circuit concept that plasma cosmologists (like Alfven) use to explain stars and galaxies. And the concept as envisioned by Alfven included double layers along the axis of rotation of the object with the known property of producing jets. 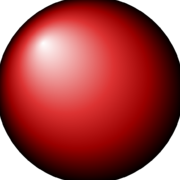 And some plasma theorists also speculate that a plasmoid forms at the center of such an object. The bottom line is that known physics can produce what is seen. Neutron stars aren't needed. Furthermore, there are problems with the neutron star model, just as there are problems with the black hole model. Did you know they’ve had to introduce "quark stars" (another gnome) to explain some of the neutron star observations? It seems that every time one turns around, Big Bang supporting astronomers and astrophysicists are adding yet another deduced, untestable, magic gnome to their celestial zoo to explain observations that might otherwise be explained with normal objects and normal physics ... if they spent a fraction as much money and time investigating them as they have these gnomes. Just saying that's not good science. That's religion. you do understand the difference between beliefs and theory's right ?and why a theory is something not proven ? Gee ... this is twice now you've claimed you were done with this thread. And yet here you are again. Can't help yourself, can you, TROLL? And no, I'm not going to feed your TROLLish behavior. If this ^^^^ is going to be the quality of your posts, it's a waste of MY time. Not when you clearly refuse to read the thread before posting your garbage. Like I said, you show no interest in learning anything beyond what you *think* you know ... in what you've been fed by the headlines in the mainstream media. So I just don't feel like having to repost what I've posted over the years yet again to feed you, TROLL. Not when you've repeatedly refused to address the content of the posts I've made with anything but throw away lines. Not when you've repeatedly refused to answer a question you're *supposedly* "unified theory" should be able to answer. 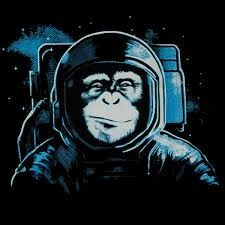 You know, the one about how the physics (gnomes) you believe in make all the helically wound plasma filaments that we see out there in space with your telescopes? So you can either begin a real discussion by trying to answer THAT question or you can go on posting nonsense like your last half dozen posts. Because if you keep making posts like the one above, you will be the one who proves you don't know ANYTHING about electricity. Even your statement that satellites should be fried (if there are currents in space) shows how little you know. Because, after all, concern about that is a big issue ... and you'd know this if you'd paid ANY attention to the news. Now I don't mind if you resort to desperation to try and debunk what all that this thread contains regarding the inadequacies of the mainstream *theory*. Or you can even tell us a third time that you're leaving this thread and the electric universe. After all, you're a gravity only guy ... right? your guys do anything like this ? or is there a theory for it ? Sadly you have old electric universe Ideas, Kinda why I call you a flat lander. You mean LHC was a bust? Or does this mean the big bang, etc crowd are about to come begging for more money. A whole bunch more money (remember, the LHC has cost over $50 billion, so far). What’s the next one going to cost? $100 billion? $200 billion? $500 billion? Not found: Supersymmetry. Extra dimensions. Direct creation of dark matter. These were the big theoretical hopes that many had for the LHC, and not only have direct detection efforts not panned out at the LHC, but many (or even most) of the models that were designed to solve some of the biggest problems (like the hierarchy problem) in physics have been ruled out. Nature still might have supersymmetric particles, extra dimensions, or particle-based dark matter, but the most promising versions of these extensions to theory have failed to show up at the LHC. They still might, of course, but there's not even indirect evidence suggesting that further data will reveal them at the LHC's energies. What has the Electric universe not found ? that rules out it's ideas to get a better version ? "plasma... a gaseous substance consisting of free charged particles, such as electrons, protons and other ions... Plasmas are the most common PHASE of matter." Clearly, plasma is not a standalone, physical object. Plasma is a CONCEPT. Specifically, it is a dynamic concept. 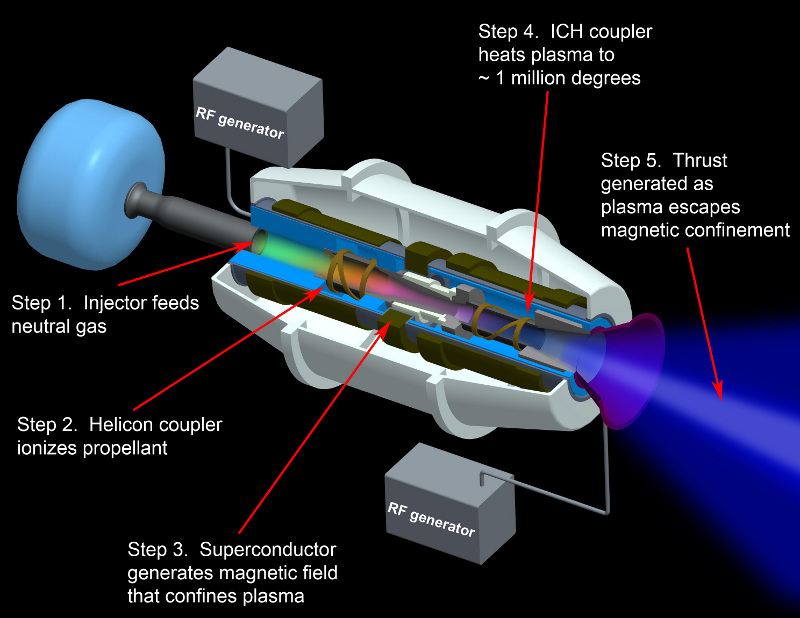 The word plasma refers to a gas that has been ionizED (i.e., “charged particles”). That’s the ‘phase’ that the electricians are referring to. In the religion of the Electric Universe, ionization is the same phenomenon as in the religion of Quantum Mechanics. Ergo: the Electric Universe is nothing but a splinter group of Quantum Mechanics. The religion of Quantum Mechanics explains that ionization is a PROCESS. Therefore, any way we look at it the word plasma means something happenED or is happenING to a gas. Plasma is a gas UNDERGOING the PROCESS of ionization. You cannot take a picture of plasma because whatever comes out (according to both the religions of the Electric Universe and of Quantum Mechanics) will be gas molecules with tiny electron beads and charged protons floating between them. This is not plasma. This is a gas-atom-proton-and-electron soup. In order for it to be plasma we have to watch a MOVIE. We have to see recombination of an electron bead with a starving atom and an opulent atom releasing an electron bead. Plasma is a ‘jumping kangaroo’. Plasma is a ‘running boy’. Plasma is a gas that is DOING something called ionization. You cannot move what is already conceptually in motion. You can fly the flying fly on an airplane, but does this make it a flying flying-fly? In its ten years of operation, the LHC made ONE major discovery … the Higgs boson, predicted by the Standard Model. Everything else it was supposed to find has turned out to be a bust. They thought they’d find particles that would comprise dark matter, more siblings or cousins of the Higgs boson, signs of extra dimensions, leptoquarks, supersymmetry particles, and on and on. But they found NOTHING to support ANY of those gnomes. NOT A DAMN THING. Proving, if nothing else, that “math” is NOT king. They say it might be 20 years before it comes on line (or more likely more if the HLC, which took 30 years to complete, is any guide). All that time and money dreaming of gnomes they will find. All that time spent publishing papers on those gnomes. ... all of which you could burn without impacting a single human life here on earth.